Constantine Josef Irechek was a Czech historian and Bulgarian political figure. He was born on July 24 1854. He graduated history at the Prague University in 1885, specializing Slav’s history. He was a professor in history and in history of Slav people and their neighbors. He was quite interested in Slavonic history and particularly in Bulgarian history. In 1882 he publish his first work – Bibliography of Modern Bulgarian Literature. 1806-1870. 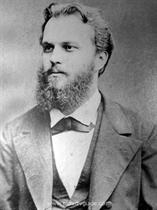 Encouraged and assisted by a lot of Bulgarians, one of which was Marin Drinov, Irechek wrote a dissertation entitled Bulgarians History, published in Czech in 1876, later in German and Russian. It also had several Bulgarian editions. This work was the first entire Bulgarian scientific history. It covered the period from the antiquity to 1875. Irechek worked it until his death. In 1939 a separate chapter was published posthumously in 1939 – entitled Bulgarians history and including his notes, additions and new materials. From 1879 to 1884 Irechek lived in Bulgaria. He worked as secretary general in the Ministry of people’s education (1879-1881), then he was minister of the education (1881-1882) and chairman of the Education Council at the ministry. In 1884 he was director of the National Library. Constantine Irechek died on January 10 1918 in Vienna.